This chart will help you determine your learning style; read the word in the left column and then find the answer that most fits you in the three columns to the right. Your answers may fall into all three columns, but one column will likely contain the most answers. The dominant column indicates your primary learning style. Knowing what kind of learner you are can help you to develop a learning strategy. Do you try to see the word? Do you sound out the word or use a phonetic approach? Do you write the word down to find if it feels right? Do you do so sparingly but dislike listening for too long? Do you favour words such as see, picture , and imagine? Do you enjoy listening but are impatient to talk? Do you use words such as hear, tune , and think? Do you gesture and use expressive movements? Do you use words such as feel, touch , and hold? Do you become distracted by untidiness or movement? Do you become distracted by sounds or noises? Do you become distracted by activity around you? Do you forget names but remember faces or remember where you met? Do you forget faces but remember names or remember what you talked about? Do you remember best what you did together? Do you prefer direct, face-to-face, personal meetings? Do you prefer the telephone? Do you talk with them while walking or participating in an activity? Do you like descriptive scenes or pause to imagine the actions? Do you enjoy dialog and conversation or hear the characters talk? Do you prefer action stories or are not a keen reader? Do you like to see demonstrations, diagrams, slides, or posters? Do you prefer verbal instructions or talking about it with someone else? Do you prefer to jump right in and try it? Do you look at the directions and the picture? Do you ignore the directions and figure it out as you go along? Do you seek out pictures or diagrams? Do you call the help desk, ask a neighbour, or growl at the computer? Do you keep trying to do it or try it on another computer? (a) like to have the aid of diagrams, posters, or a demonstration. (b) like to have verbal instructions. (c) just go for it and try it out! (a) visualize in your mind the descriptive passages? (b) enjoy the characters' dialogue? (c) sometimes read action stories, but would prefer not to read? (a) try to "see" the word? (b) sound the word out before or as you spell it? (c) write the word down to find out if it looks or "feels" right? (a) are distracted by movement and untidiness around you. (b) are distracted by noises in the area you're working in. (c) have difficulty sitting still for even short periods of time. (a) write the problem down or draw diagrams to visualize it. (b) talk to someone (or yourself) about it. (c) try and use concrete objects to find a solution. (a) follow the instructions and look at the pictures. (b) wish there was a video or tape explaining what to do. (c) ignore the instructions and figure it out as you go! (a) the person's face but not their name? (b) the person's name but not their face? (c) clearly the situation in which you met them? (a) visualize the route first or draw a map. (b) give clear, concise instructions. (c) move your body and gesture as you give them. (a) look for pictures or diagrams to explain the solution? (b) ask someone for help or call a help desk? (c) persevere and try to figure it out yourself? (b) recite the list to yourself. (c) use your fingers to count the items off. 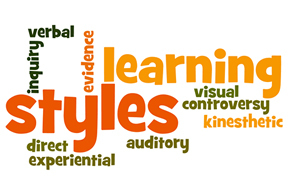 Many people may have more than one learning style so you may find you have some responses in each category. The category with the greater number of responses may be your main learning style. (a), you are a visual learner. (b), you are an auditory learner. (c), you are a kinesthetic or tactile learner.